Soccer Safari Video Slot Guide & Review - Casino Answers! Soccer Safari is a 5-reel, 30-line video slot developed by the Microgaming online casino software provider, featuring wild substitutes, scatter wins, expanding wilds, multipliers, free spins, a gamble feature and a bonus game. 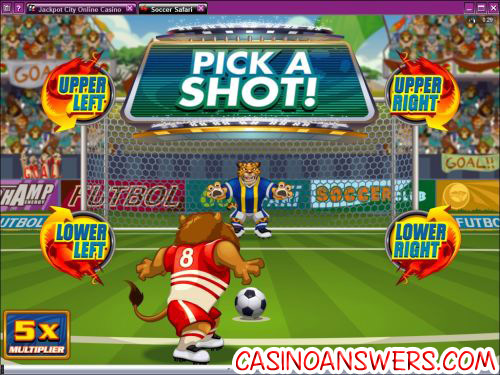 You can play Soccer Safari at Gaming Club Casino and All Slots Casino. Soccer Safari’s theme can probably be guessed by the name – animals playing soccer. There are lots of animals featured in the Soccer Safari video slot include: Lion, Rhino, Leopard, Warthog, Hyena, Zebra, Elephant, Giraffe and more. All of the symbols are animated excellently with upbeat music that plays during the game. People with slower computers should be forewarned that Soccer Safari has hefty recommended system requirements for a video slot – Core 2 3 GHz, 2 GB RAM and a 256 MB video card. To play the Soccer Safari video slot, set your coin size at one of the following values: $0.01, $0.02, $0.05, $0.10 or $0.20. Now, if you want to change the number of active paylines from 30, you can do that. Also, set the number of coins you wish to play (up to 20). Hitting the “Bet Max” button will play all 30 lines and 20 coins on your coin value, so make sure you don’t hit that by mistake. It could be expensive! Speaking of expensive, Soccer Safari allows for bets from $0.01 up to $120 per spin. That kind of wagering versatility gets extra points from us. 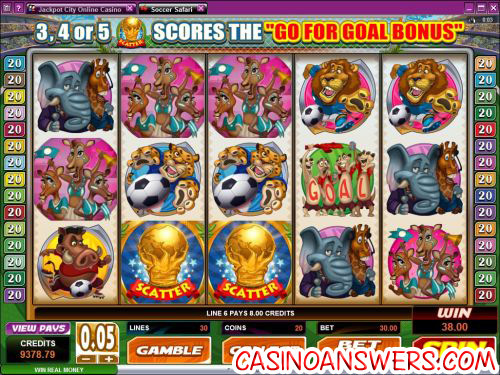 The top jackpot on the regular slot game of Soccer Safari is 2000 coins your bet per line for 5 Soccer Safari symbols. Other significant jackpots are the 5 Lion symbols for 1000 coins and 5 Rhino symbols for 700 coins. The Soccer Safari symbol is the wild symbol and will substitute for all other symbols (except for scatters) to complete winning combinations. While the Soccer Safari symbol is the highest fixed jackpot, there will be another way to win even bigger later on in this slot review. When the Zebra Referee symbol appears anywhere on reels 1 and 5, you will win 5 Wild Free Spins! Reels 1 and 5 will expand to become wild. The three center reels will spin five times. When complete, the center reels are held and reels 1 and 5 are spun again. Free spins can be re-triggered on the final spin. all bets and lines played during the free spins are the same as the game that triggered the feature. After any win on the Soccer Safari video slot, you have the option of hitting the “Gamble” button to launch the gamble feature. Here, you will be able to double or quadruple your win if you are successful. To double your winnings, you must predict the card colour correctly. To quadruple your winnings, guess the suit of the card correctly. You may gamble your winnings until the gamble limit has been reached. Use “Collect” to accept your winnings and end the gamble feature. If three or more Scattered Trophy symbols appear on the reels on the Soccer Safari slot machine, you will trigger the Go For Goal bonus game where you can win up to 60,000 coins. The bonus game has some of the best presentation in a video slot bonus game we have seen in a long time. As you could assume, the bonus game is set at a soccer game; a penalty shootout to be precise. There are cutscenes with announcers and also ones that play your actions rather than a simple animation. In the game itself, you must have one of three teams and five players to choose from. This will determine the multiplier you will receive. Next, you will be taking a penalty shot and you must choose which location to shoot the ball – Upper Left, Lower Left, Upper Right or Lower Right. If you score, you’ll obviously win much more than if you don’t, but you will win regardless. To access Soccer Safari’s autoplay mode, hit the “Expert” button at the bottom of the screen. You can use the “5x” and 10x” buttons to play a few autoplay spins or you can hit the “Auto Play” button for advanced settings. In the advanced settings, you can set the number of autoplay spins (5, 10, 25, 50, 100, 250 or 500) and to stop if a win exceeds $100, $500, $1000, $5000 or $9999. Autoplay will stop if a feature is triggered. You can cancel autoplay at any time. Soccer Safari is definitely in the top 5% of Microgaming’s slots, showing that Microgaming is not at all falling behind any of other casino software developers. It’s got an excellent bonus game with potential to win huge, free spins with expanding wilds and is generally a fun theme for both animal lovers and soccer fans. For a 100% up to $100 signup bonus that will give you extra free cash to play Soccer Safari with, sign up and make your first deposit now at Gaming Club Casino! Are USA slots players able to play Soccer Safari for real money? Unfortunately, casino players based in the United States are prohibited from depositing real money at Microgaming online casinos. For some US-friendly video slots with some excellent bonus games in their own right, we think you’ll love the iSlots. They’re interactive storyline-based video slots that are almost video games. To try some of them out, you can read our Heavyweight Gold iSlot Review, Rock On iSlot Review and Psychedelic Sixties iSlot Review or just head on over to Slots Jackpot Casino! Are there any Africa World Cup Casino games? Where can I play the football safari slot machine?